Description: The hairless, 1 inch (2.5 cm) long flowers are narrowly tubular and have 5 barely spreading, rounded lobes and stamens that project beyond the corolla. 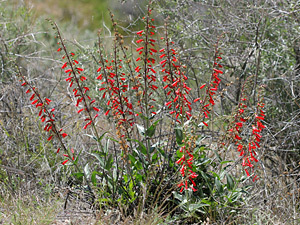 The showy flowers are clustered along tall flower stalks. The leaves are green, leathery, opposite, and ovate at the plant base to lanceolate higher up on the plant. 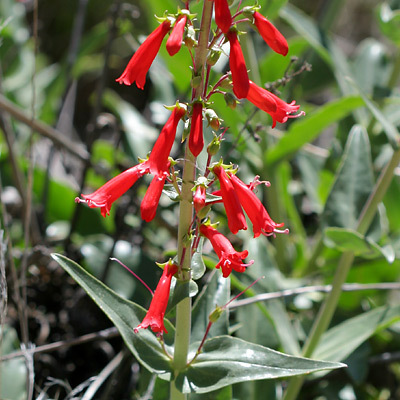 The similar Hackberry Beardtongue (Penstemon subulatus) has non-projecting stamens, narrower leaves and flowers, and more spreading flower lobes. Both the plants and seeds are commercially available. These attractive, easy to grow plants are popular for both xeriscape gardens and native landscaping.